A specimen of the newly described “Burumoseria yuae,” dorsal view, collected in Taiwan. Researchers detail the discovery of a new species of flea beetle, Burumoseria yuae. Nausea, vomiting and weakness are but a few of the symptoms one might anticipate after eating leaves from the Taiwanese shrub Erycibe henryi. This wild plant produces powerful toxins as a self-defense against herbaceous insects and other creatures that might otherwise feast upon its leaves. Yet one tiny flea beetle has outwitted this poisonous shrub. Meet Burumoseria yuae; it lives and feeds exclusively on E. henryi, gnawing large holes in its toxic leaves. Konstantinov and co-author Chi-Feng Lee of the Taiwan Agricultural Research Institute recently described and named B. yuae as a new species in The Coleopterists Bulletin. Here, Konstantinov answers a few questions about this beetle that is hundreds of thousands of years old yet has only been known to science for a few months. Q: What is a flea beetle? Konstantinov: Burumoseria yuae is one of some 50,000 known leaf beetles (Chrysomelidae: beetles that eat leaves) and among some 12,000 leaf beetles that fall into the sub-category of flea beetles (Alticini). Flea beetles are so named because they jump like fleas. Their metafemora, the first segment of the hind leg, is very big, swollen, and has quite a few muscles. There is a little spring inside which is sort of pulled by the muscles and then it snaps suddenly and releases energy. This sends them into the air. Their jumping is a defense. Since flea beetles live on the surface of leaves, they are quite visible to a potential predator. When they see a bird or something moving in their direction, they jump and essentially disappear. Some fly after they jump and some just fall on the ground and pretend to be dead. Q: Is this new beetle rare? Konstantinov: Yes. It belongs to one of the least known genera of flea beetles, one not found in Taiwan before. The genus is rarely collected in the field and is uncommon in museum collections. Only two other members of its genus are known, and they are from tropical islands in Asia. It is quite a find. In fact, I am not convinced that this genus (Burumoseria) actually belong to the flea beetle group, they are kind of in the middle between flea beetles and another related group that doesn’t have a common name. To find another species of this genus is quite interesting, as it gives us more data to perhaps properly re-classify this genus. Q: With 50,000 leaf beetles known, how do you tell species apart? Konstantinov: We usually look at various morphological structures, for example the head, the shape of the antennae and their proportions, shape of legs, and general body shape. In the genus Burumoseria, for example, there is a little groove or depression that runs across the pronotum—the structure to which the head is attached. This is a relatively rare feature among leaf beetles, as usually the pronotum is one solid convex plate. Inside the pronotum are various muscles attached that move the head and the front legs. It could be that the muscle attachment here differs in this particular genus. 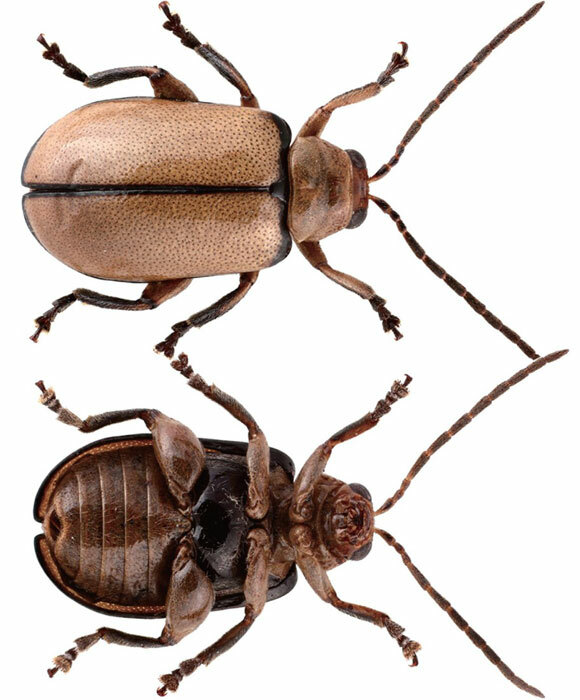 Within the genus, leaf beetles experts must use male and female genitalia to tell species apart. To do this the beetles need to be dissected under a microscope and their genitalia studied. Externally, beetles can be quite similar but the shape of their genitalia is usually significantly different and species specific. Q: Is this to prevent interbreeding? Konstantinov: There is a view that under some conditions genitalia may evolve faster than other morphological structures to sort of ensure breeding within the species. So that species that look very similar externally may have very different genetalia. Q: Where did B. yuae get its name? Konstantinov: B. yuae is named after Mrs. Su-Fang Yu who discovered this beetle. She is a member of the Taiwan Chrysomelidae Research Team, a team of professional and amateur entomologists devoted to inventorying all species of leaf beetles in Taiwan. Be the first to comment on "New Species of Flea Beetle Discovered, Burumoseria Yuae"